Last year I made these snowflake decorations from air drying clay – this easy to use material was a revelation to me, so I wanted to share another lovely idea with you. You can buy DAS air drying clay in art shops or from Amazon. 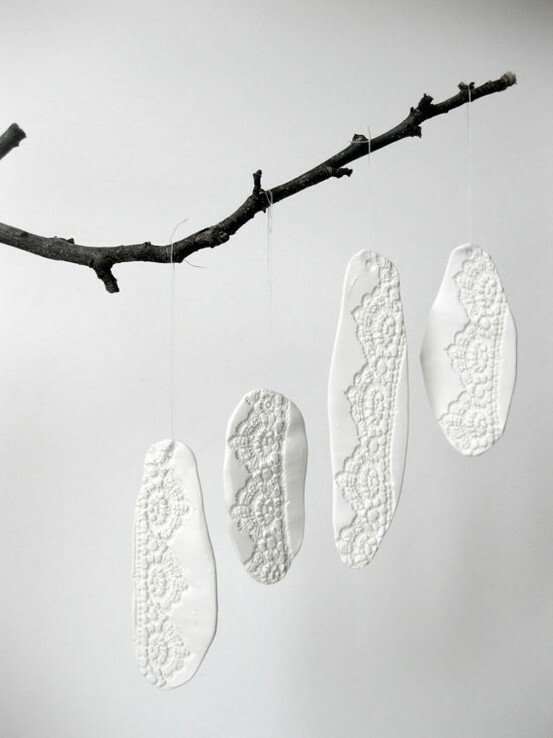 To make these tree decorations you could simply roll out small sausages of clay, lay on a strip of cotton lace trim and go over with a rolling pin to impress the pattern. Make a hole in the top with a darning needle and then lay out to dry. Gorgeous! I made some hearts with a lace imprint yesterday actually which I’m hoping to turn into a garland of sorts. The heart garland sounds gorgeous. I do love a good garland! Thanks for the source – I’ll add a link straight away. Oh, actually quite tempted by these, very pretty! And the clay isn’t expensive at all.